I met Executive Chef William Benner during my stay at the Black Point Inn, in late June 2013. 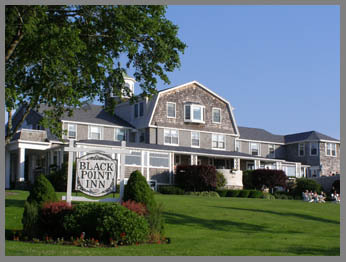 The luxury 25-room and suite Black Point Inn, a member of the Historic Hotels of America opened in 1878, in the exclusive section of the peninsula of Scarborough, Maine known as Prouts Neck. Surrounded by the Atlantic Ocean on three sides, its stunning location, luxurious appointments, two outstanding restaurants, and excellent service attract discerning clientele who come to partake of the Inn's charm and the natural beauty of the area. During the course of our meeting, I learned that Chef William Benner, a native of Philadelphia, Pennsylvania, started cooking for his family at a young age, gathering recipes from his aunts and uncles and keeping them in a recipe box. He worked at Pizza Hut in high school, and upon his graduation, he went to Montgomery Community College for teaching; however, his heart was not into it. Encouraged by his mother, he decided to pursue what he enjoyed and had a talent for, and enrolled in the prestigious culinary school, The Culinary Institute of America located in Hyde Park, New York. Since I have taken classes at the "CIA" myself, I know the rigorous training associated with the school. When one walks out of the kitchen there, students have an excellent foundation of culinary skills and technical abilities to succeed. He made the most out of his culinary school days, gathering recipes, working hard, and going to the library for 2-3 hours per night doing research to take full advantage of all he was learning at the school. In addition to studying, he also held a full-time job while in school. Certificate in hand, he moved to San Francisco with friends and honed his career working with renowned Chef Jeremiah Tower, who along with Alice Waters and Wolfgang Puck, helped develop the concept of California Cuisine. Describing the experience, he said that on his first day he felt nauseous, and that his sense of fear, along with continually asking questions, and always learning, kept him going. From his experience there, he learned about sheer decadence, about sparing no expense, about plate presentations, flavor profiles, and learning that when you have good things you do not need to do a lot, the earth already did it, and to keep it simple. As part of a stage, he continued his culinary training at the celebrated Ballymaloe House Hotel and Restaurant located in Shanagarry, County Cork, Ireland, working with the owners, Myrtle and Ivan Allen. He compared Myrtle to Alice Waters in the United States, as she raised the collective consciousness of cooking in Ireland. He described his experience there as amazing. Upon arriving, he received a list, a hoe, the direction to the garden, and instructions to gather the herbs and vegetables needed for the restaurant. It was in the garden, pulling the vegetables from the earth, washing them, and preparing them, that he learned how good products could taste. Chef William Benner continued to hone his skills working at top restaurants throughout the United States, and cooked at the 2000 Olympics in Sydney, Australia and in 2002 in Salt Lake City, Utah. He also shared what he learned, working as a Chef Instructor at Southern Maine Community College, where he taught culinary arts. 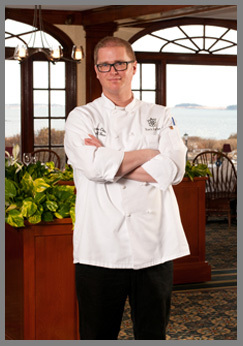 He joined Black Point Inn as the Executive Chef in May 2011. His advice for future chefs: The job requires being on your feet for long hours so purchase 5 pairs of black shoes and rotate them daily, and purchase 14 pairs of socks, have a pair for the morning, and a pair for the evening to take care of yourself. Think about where you want to be in 5-10 years, get a job working in a restaurant, see what it is like working 7 days per day and long hours, sometimes needed, to make sure that you have the passion and heart needed for the job, and if you go to culinary school, make the most of your experience. His favorite seasons are fall and winter, and products that you forget about during the time of plenty in the spring and summer, like parsnips, turnips, rutabagas, and cabbages, when the realness of being a chef comes into play. Chef William Benner's favorite spice is cinnamon for its versatility to enhance savory or sweet creations, using it to brine chicken, to season pork tenderloin, use in coffee, and in ice cream. Asked about his favorite cooking tools, he replied, a cleaver, for its practicality to chop, use on its side to crack nuts, and use to scoop up items quickly, a wok, and chopsticks. When not working in the kitchen and developing new recipes, an avid skier, you can find Chef William Benner out on the ski slopes. Executive Chef William Benner graciously shares his recipe for Lamb Tenderloin with Basil Mash, Olive Tapenade, and Tomato Fondue to tempt your palate into making a trip to the Black Point Inn and experiencing his creations at The Point Restaurant. He writes, "Lamb is one of my favorite things for dinner. We use lamb tenderloin for this dish here because of its wonderful flavor and ease of use." Method for the Lamb: The first step is to marinate your lamb in olive oil, a squeeze of lemon, and some freshly cracked peppercorns for at least 2 hours. Method for the Tapenade: While the lamb is marinating, prepare the tapenade in a robot coupe (or food processor or blender) by slowly pulsing together all of the tapenade ingredients. Method for the Fondue: The tomato fondue is next. The trick to this is in slowly cooking the tomatoes over very low heat until the tomatoes have literally "melted." Once the fondue is ready, you will want to cool it down as fast as possible or you wind up with tomato sauce. Method for the Basil Oil: The basil oil is quite easy. Blanch and shock the basil in a bowl of ice water, strain, and place the basil on a kitchen towel and squeeze out as much water as possible. Puree the basil with the oils and you are done. Now you are literally down to the meat and potatoes of the dish. Method for the Potatoes: First, you will want to start the potatoes. Place the unpeeled potatoes in a large stockpot and cover with ample cold water, put in some salt, and bring to a simmer. You will know when the spuds are done when they fall off a small paring knife. Drain the potatoes, place them on a sheet pan with some damp kitchen towels on top, and put into a preheated oven to steam off as much water as possible. This is a "Chefs' Trick," as by removing the water inside the potato you will be able to add in more butter and cream. Place the potatoes with the remaining ingredients into a mixing bowl and blend. Season with a little salt and pepper and keep hot. Method for the Lamb: Remove the lamb tenderloins from the marinade and grill. Presentation: To assemble, you place the spinach in the middle and spread it out in a circle on the plate. In three little piles, alternate the tapenade and the fondue on top of the spinach. Scoop some of the mash onto the spinach. Top with grilled lamb, squirt a touch of basil oil on it, and you are done. Enjoy! The Point Restaurant serves dinner nightly from 6:00 pm until 9:00 pm, features a daily changing menu, and is open to guests of the Inn as well as to the public. The restaurant is open seasonally from May until the end of October. Read about The Point Restaurant in the Restaurants section. Read about the Black Point Inn's other restaurant, The Chart Room in the Restaurants section. Read about the historic Black Point Inn, which opened in 1878 and is a member of the Historic Hotels of America in the Hotels and Resorts section. Read about what to do in the area in the Destinations section. Follow Luxury Experience on Facebook at www.Facebook.com/LuxuryExperience to see more photos of the Black Point Inn. © July 2013. Luxury Experience. www.LuxuryExperience.com. All rights reserved.